Have you heard about Sociocracy? When a group of people work together in a voluntary capacity to develop a significant project, they will at some point need to find an effective way of organising themselves in order to give the right amount of attention to all the various tasks involved in making that project happen. Bridport Cohousing was fortunate to be introduced to Sociocracy by James Priest and, recognising that it provided the tools needed to develop an effective organisational structure and make good decisions, adopted it. We also opted to be a Benefit Society, which meant we were a Community Land Trust, and developed the Society Rules to support our use of Sociocracy. Sociocracy developed in the mid twentieth Century, in an electronics firm in the Netherlands. It employs the strengths of the traditional hierarchical structure, where ideas and information are efficiently fed from the top down, but counters its weaknesses by structuring-in the flow of information and ideas up the organisation. This two-way flow of ideas is the basis for Sociocracy being called Dynamic Governance in the United States. John Buck, an American, learnt Dutch in order to understand Sociocracy and then brought it to the English speaking world. Diana Leafe Christian, another American, has adapted Sociocracy to reflect the needs of community-led groups; Bridport Cohousing benefits from this and appreciates the work Diana has done with us. 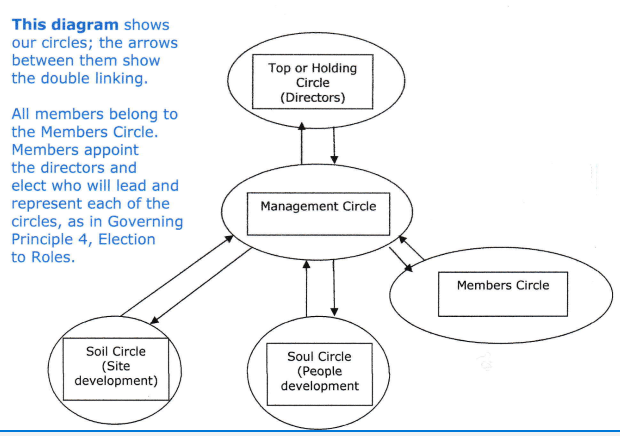 See structure diagram below for the circles in Bridport Cohousing. Higher and lower in this context means more abstract or more concrete; so for BC planning is more abstract work, gardening is more concrete work. The roles are operational leader, facilitator, secretary and logbook keeper. An important rule of our society, Bridport Cohousing Limited, is that each member has an equal voice and vote, and Sociocracy reinforces this. When working on a proposal we use a series of rounds in which members are invited to contribute in turn to the discussion, and then the decision making process. Everyone has the right – and even the responsibility – to raise ‘argued and paramount objections’ to a proposal, if they have one. ‘Argued’ means it has to be a real reason that can be explained, and ‘paramount’ means a serious objection which, if ignored, would damage the project in some way. We have found that when we are working on a proposal we may start with a really wide range of opposing views on it, but Sociocracy helps us to find our way through the objections to making good decisions that everyone can be part of. Decisions are made by members giving their consent; where a member objects the reason for their objection is explored and a solution is sought. Members do not have to like the policy, they just need to be able to live with it and have no argued and paramount objections. Sociocracy provides the governance structure for our Community Land Trust – which has the aim of creating an affordable cohousing neighbourhood for the benefit of local people that will continue to be affordable into the future. This structure, where open discussion precedes the election of members to roles, helps us to be transparent in our processes and decision, a key to establishing trust between members and with external organisations that work with us. This is a brief introduction. Sociocracy is best learnt by doing it, by taking part in making decisions and electing people to roles – we provide training for new members and refresher sessions for experienced members. It has given us confidence in our ability to make good decisions; and to encourage one another as we recognise and value the skills and understanding members bring to taking on these roles. 1. We the People: Consenting to a Deeper Democracy by John Buck and Sharon Villines, 2007. Sociocracy.info. Washington DC. https://en.wikipedia.org/wiki/Sociocracy is a good starting point for further reading online. Bridport Cohousing uses Sociocracy as a method of decision-making and of organisation, the two being intimately linked. We require that all new members purchase a copy of the standard book on the subject: “We the People: Consenting to a Deeper Democracy” by John Buck and Sharon Villiers.